In Slovakia today even questioning state subsidies to religious bodies ― €37.19 million in 2009 ― can be politically risky, as a Slovak government minister found when he was scolded by Catholic bishops for raising the issue without consulting them first. And Slovakia seems positioned to influence Europe. The strategic EU committee in charge of women’s rights and equality has been headed by the Slovak Anna Zaborska, who has strong personal and political ties to the Vatican. 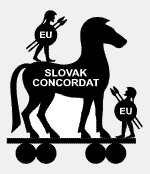 Slovakia's first concordat was a framework treaty concluded with the Vatican in 2000. This promised four more concordats in order to increase Catholic influence in schools, the armed forces and health care and to finance all of this with funds from the state. So far, only the concordats for education (2002) and the armed forces (2004) have come through. The Vatican has been pressing for the outstanding finance concordat and even making a renewed push for the conscience concordat whose controversial provisions concerning health care led ultimately to the fall of the government in 2006. As is customary, a few concordat privileges were given to other religions. These are set forth in the 2002 Agreement between the Slovak Republic and registered churches and religious societies. At one stroke this served to head off any opposition to the Vatican concordat from eleven other religious groups. This is an audacious five-year plan by the Slovak bishops for Catholicising Slovakia. Among the recommendations is saturation by Church media (1.6.3j), and indeed from 23 January 2007 the bandwidth of the BBC World Service was turned over to the Catholic station, Rádio Lumen.